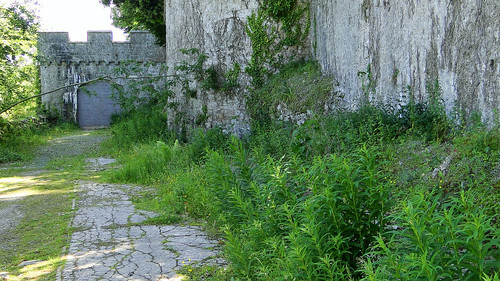 Back in the 1950s, Gwrych Castle in Abergele was known as 'The Showplace of North Wales', a sort of early version of Alton Towers with a variety of small attractions within its grounds. It was a very successful attraction, in 1950 pulling in over 750,000 visitors to Abergele and attracting 10,000,000 in total during the years it was open. 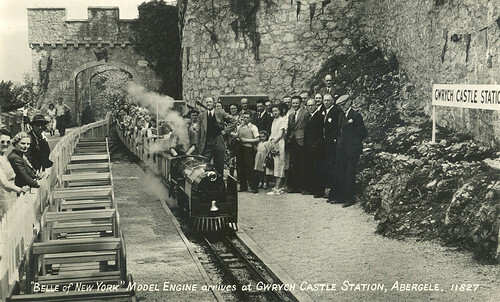 One of the best remembered attractions is the Miniature Railway - it ran from the Upper Courtyard to a Station situated deep in the Great Castle Wood. I'd seen an old postcard showing the miniature steam engine 'Belle of New York' at the Upper Courtyard Station and thought I would try and recreate the shot from a modern day perspective. The concrete base of the stations remain but the rails themselves have long disappeared (the line of plants to the right in the modern day photo marks where the rails have been removed). Very interesting photo...I didn't know of this little railway. It looks absolutely charming, how I would have liked a run on it! I keep driving past the castle- will have to stop and have a walk next time.